This one started as one of the freebie cards I gave away with the Frodo auction, after I drew the card I just couldn't not paint it. With this piece I really got into the idea of the main figure being dark and dull and the background mist illuminating his outline. 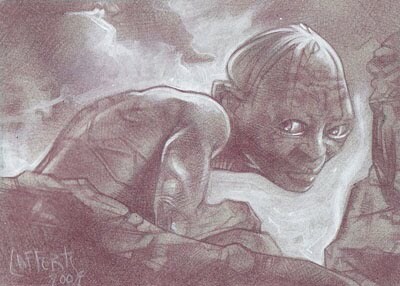 I think it speaks to the character of Gollum.